Mom, you’re the most beautiful! recall the most beautiful hours of her life. Judit is a champion. Intelligent and courageous, she knows what she wants. The mother of two children, she wishes to give them only the best, and first of all her love and her joy of life. watch honor the Duchesse of Cambridge. This delicate creation charms through its purity and simplicity. Ten diamonds set in the lower part of the timepiece symbolize their ten years of happiness together, while three diamonds set at their three children’s birth hours will always remind her of the most meaningful moments of their life. 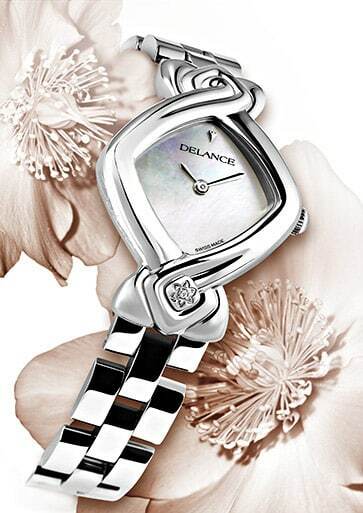 For her 75th birthday, all of my mother’s children presented her a Delance “My Mother’s watch” watch. The first row is set with five rubies, each at her five children’s birth hour. On the first row, two diamonds represent the hour of her children’s births. On the second row, four diamonds mark the birth times of each of her grandchildren.